Rallycross is a form of sprint style automobile racing, held on a mixed-surface —tarmac and dirt— racing circuit. Competitions can be watched entirely from the stands, since they take place on short tracks. High-performance compact cars with speeds that reach beyond 600 hp, the world’s highest acceleration, even greater than a Formula 1. The FIA World Rallycross was developed from the European Rallycross Championship of the FIA (Euro RX), which finds its roots in the European Trophy of 1973, and which became a permanent championship of the FIA from 1976. The FIA World of Rallycross presented by Monster Energy (World RX) was established in 2014. In its fifth edition it will be composed of the following rounds: Catalunya, Portugal, Belgium, Great Britain, Norway, Sewden, Canada, France, Latvia, USA, Germany and South Africa. 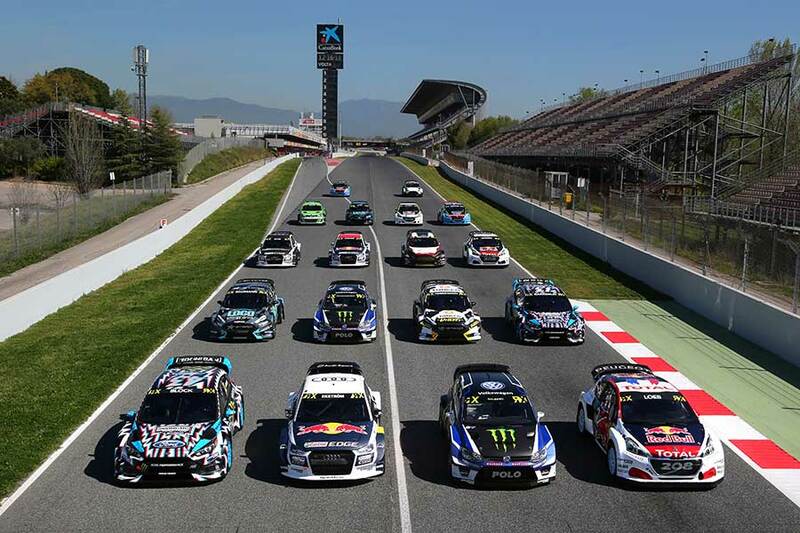 The FIA ​​World Championship has its greatest esponent in Rallycross Supercars category. The FIA ​​European Championship has titles separated by drivers in the following categories: Supercar, Super1600 TouringCar and RX 2. Supercar: Where the big stars like Petter Solberg, Jacques Villeneuve, Tanner oust or Mattias Ekstrom compete. It is a utilitarian production adapted to the most spectacular race with turbo engines, two-liter with 600 bhp and allows the greatest possible acceleration of 0-60 mph (100 km / h) in 1.9 seconds (more than a Formula 1). Super1600: front-wheel drive vehicles that use the 1600cc engines, where many drivers Supercar today began to emerge as Liam Doran, Timerzyanov, Bakkerud and Nitiss. TouringCar: Vehicles with rear engines and two liters. The front-wheel drive vehicles produced can be converted to rear. This is the reinterpretation of traditional Rallycross. RX 2: Built by Olsberg MSE their Spec are all identical. It is a category for promotion and support of the Championship. 310bhp, mid-engine, four-wheel drive racing cars. Each event consists of several training sessions that are open to the public, four qualifying heats, two semi-finals and a final. There are four qualifying heats with a maximum of five cars competing in four heats. Q1: The starting positions of the races are determined by drawing lots. Q2: The starting order is determined by the time of each driver in Q1. The same format is used to Q4. All qualifying heats will be timed and the fastest driver in each series will be rewarded with 50 points (the second 45, third 42, fourth: 40, the fifth, 39, 38 the sixth and so on. After qualifying, there will be an intermediate classification according to the total points of each pilot marked in the four series. Semifinals: two sets of six cars each. The top three of each set qualify for the final. The semifinal is played on six laps including the Joker lap. In the semifinals the points won are valid to the classification of the World Championship. Final: The top six riders compete in a six laps race including the Joker lap. The first three reach the podium. The winner of the final will be the winner of the event. The remaining drivers are classified according to the points achieved in the race. The winner of the final will be the absolute winner of the RX event. The positions one through six will be classified according to the final results. The remaining riders are ranked according to the points scored during qualifying rounds and the different phases of the event.